What I’ve learnt from the Italians. You can bake without butter. I grew up in a fairly butter heavy culinary environment. In the sense that at my parent’s house there is always a butter dish on the kitchen bench, with salted butter ready to be smeared on toast, sneaked onto potatoes and used in cakes. My mother rarely fries or roasts in butter; she uses carefully conserved dripping fat for roasting, and has used olive oil as her cooking fat of choice for decades, but the butter is always there and you never run out; there are even extra pats in the freezer for emergency baking. I ate a lot of butter growing up, mainly because mum baked bread (in her 1980’s rebellion against the then very poor selection of bread available) and who wouldn’t cover a slice of just out of the oven bread with butter and jam? At 16 a family friend told my sister and I that if we didn’t watch it with the butter we’d turn into dairy maids, and his words have been ringing in my ears ever since. Romans are almost afraid of butter, and from a distance I assumed it was because they had an innate inner wisdom that others didn’t, that the dieta mediterranea was merely a well made choice. 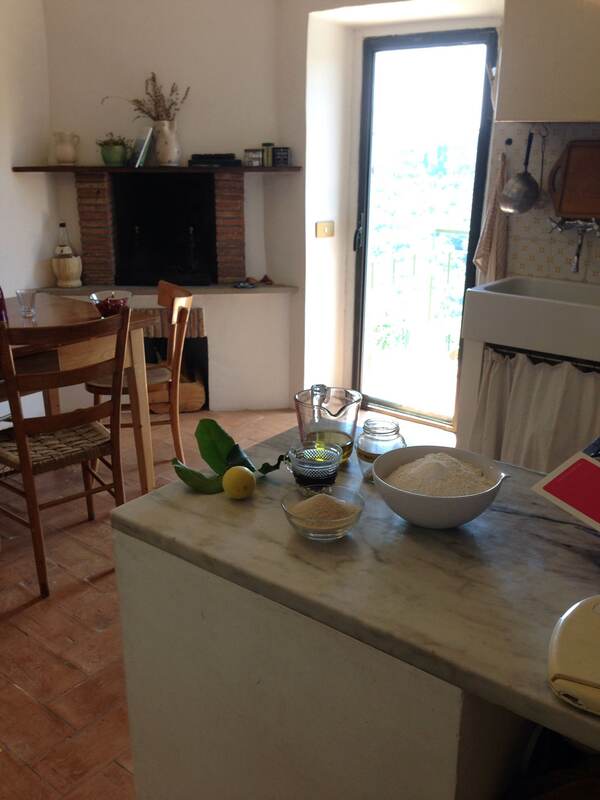 But choice is a 20th C, supermarket age construct, and culinary traditions are not born from choice but circumstance, and that is why central and southern Italians use olive oil and shy from butter, while northern Italian recipes are full of dairy. I’ve written about fat and Italian regional uses here before, part of my long running obsession with the incredibly good Neapolitan sweets like Sfogiatelle Napolitane which use lard, which gives the pastry its incredible flakiness; and is a genial derivative of the fact that pork fat is cheap and not everyone in Naples had an olive grove in their backyard in the days when such culinary wonders were created. Southern Italians don’t use a lot of butter because southern Italy isn’t dairy country, and interestingly, perhaps Rome’s best cheese purveyor once told me that Italian butter isn’t much good anyway because the best cream from milk ends up as Parmiggiano. After ten years in Italy I’m still a butter lover through and through, and despite eating much less of it, I continue to believe that some things will always taste better with butter (think shortcrust and sablé pastry). But I have also become a true fan of cakes and biscuits senza burro, and would go as far as saying that cakes with oil, both in the olive and sunflower varieties, have great elasticity and moistness that is hard to match. The classic ring tin cake, that I’ve written about here before, and whose recipe I borrowed from my talented friend Rachel (now part of her thoroughly honest traipse through Roman food in her book Five Quarters) is one of these. 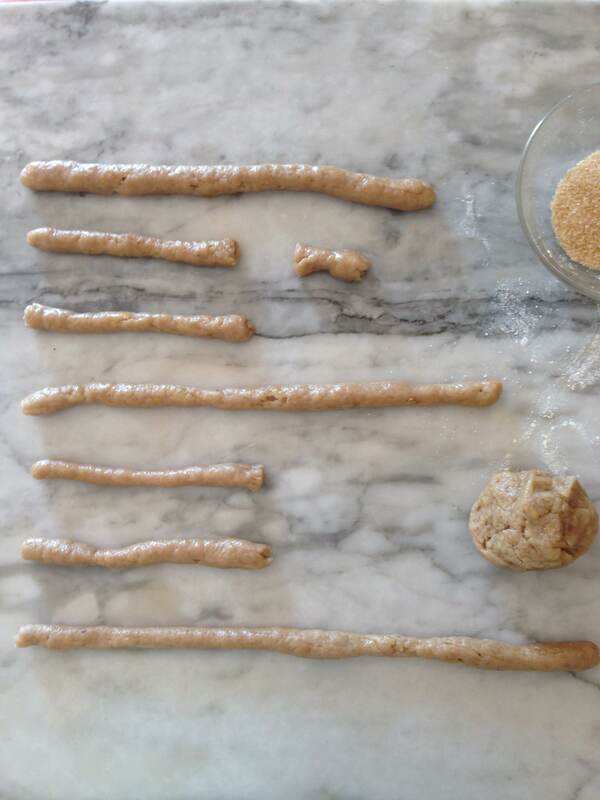 Today’s recipe is not for a cake but for biscotti. Ciambelline al Vino are rustic, mis-shapen ring biscuits made with wine and olive oil that are found all around central Italy and that are as splendid dunked milk in the morning as they are in wine after dinner. Classic ciambelline al vino are flavored with aniseed seeds or liquor which rounds out their sweet but not too sweet after dinner digestive role. I didn’t have any aniseed handy but what I did have was my hand picked home dried fennel flowers from last summer which gave me enormous joy to use, the fennel flowers having just the right perfumed herbaceous note for the job. Mix the dry ingredients in a large mixing bowl and make a well in the middle. 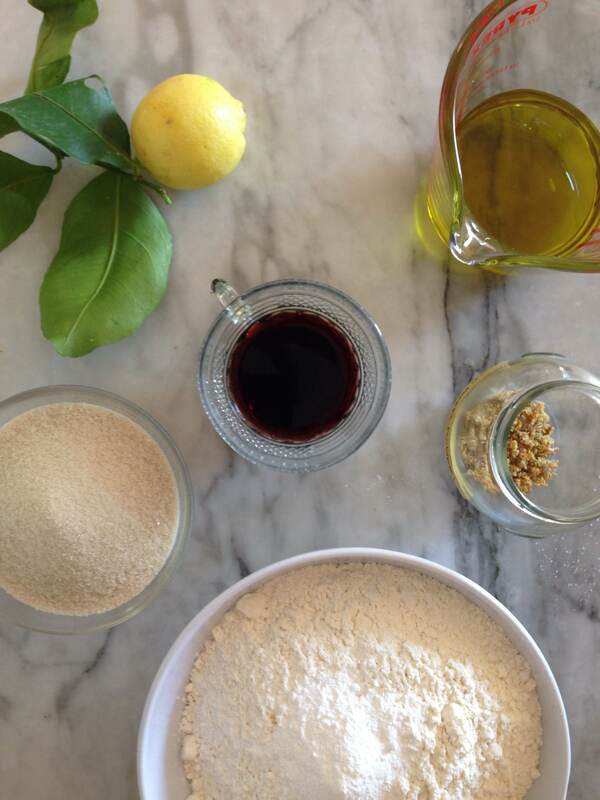 In a jug combine the oil and wine, adding the lemon zest and aniseed and then pour into the dry ingredients mixing vigorously until the dough has a good uniform consistency. If the mixture is too wet add more flour, if it seems too dry a little more wine. Flour a good work surface and scoop out a handful of the dough to be rolled into a roughly 20 cm long snakes. The oil content makes the dough not as sticky as other biscuit dough, but somewhat slippery to handle. 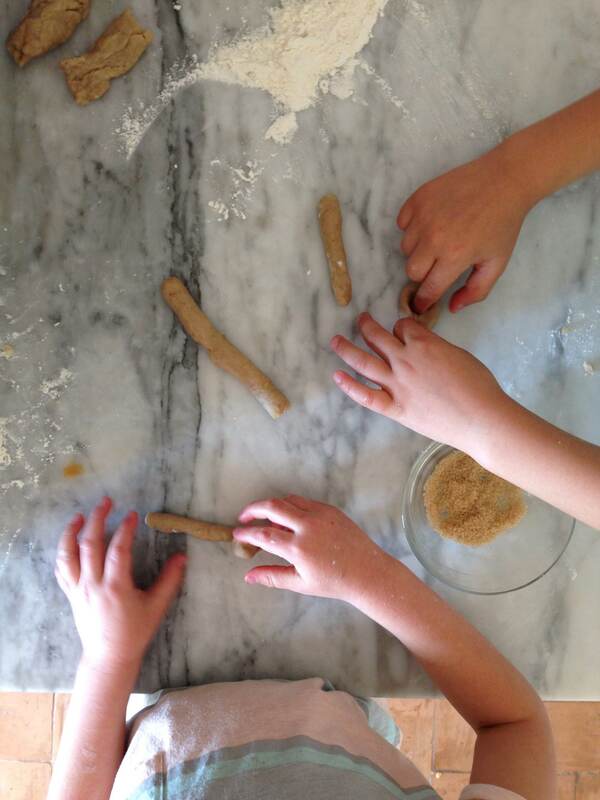 Its playful nature makes the rolling of the serpents fun for the little fingers of any kitchen helpers, and seeing as the Ciambelline rustic things, no-one cares about far from perfect ring making. 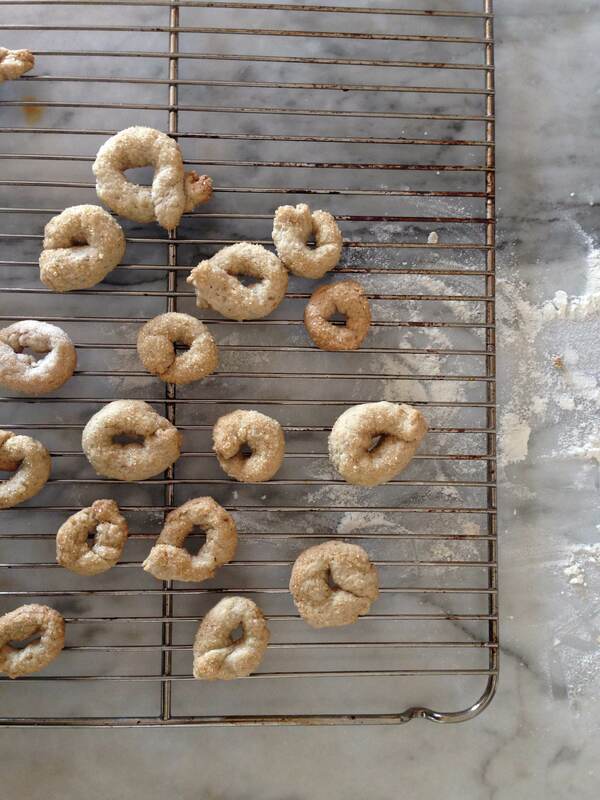 Once the rings have been formed dip one side of each biscuit into a bowl of raw sugar and place on a baking tray lined with greaseproof paper. Bake at 180 degrees C for about 20 minutes. Ali heavenly reading…I actually have memories too of the squares of butter in a dish on the side board at your house for breakfast (something we were never allowed as kids due to Dads high cholesterol & the belief marg was better)….Love the photography & your away from home kitchen – esp the marble bench top…. I actually tried a more liquid version and piped them out of a sac – a – poc to see if I could make them a bit faster than all that rolling….. Worked quite well and they were a bit lighter once cooked. My dad loves ciambelline al vino….with a glass of vino of course. It wouldn’t be Easter or Christmas at my home without ciambelline (or ciambellette in our Aussie/Roman family) and always with aniseed. 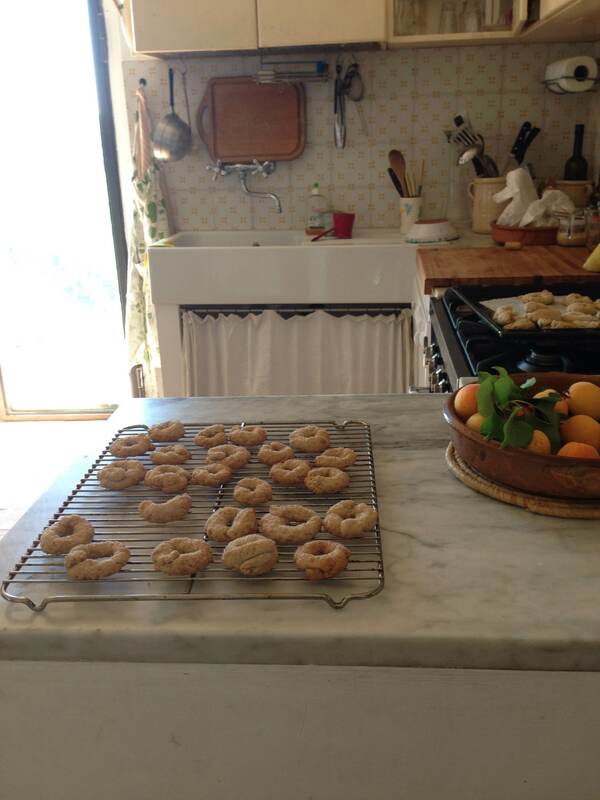 Mamma’s recipe calls for equal parts oil, sugar and wine, with flour as required. We soak the aniseed in wine before adding to the mixture. Have experimented with including a little self raising flour or baking powder. They are definitely a family favourite! When I was in Rome recently I found ciambelline in many bakeries but not with aniseed unfortunately. The aniseed really makes them I think. Does your recipe have lots less flour than mine, would love to try because I love them when they are really light and airy. Thanks for visiting Laura.